Book Fest Blog #1: Good Grief, the Sun’s Out! What on earth has happened? The grass in Charlotte Square is covered with people eating ice cream, instead of puddles… Or at least, it was yesterday, but who knows what today will bring, weather-wise? 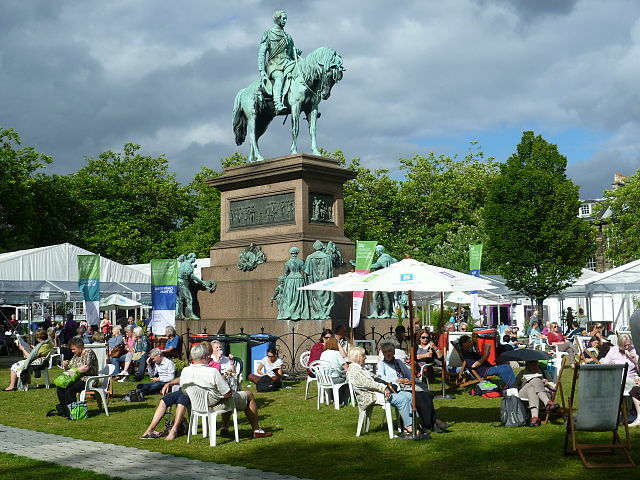 Yesterday was my first day at this year’s Edinburgh International Book Festival. I was lucky enough to be in the audience for an event featuring Joan Lennon speaking about her excellent novel Silverskin and Katherine Rundell talking about her marvellous new novel Wolf Wilder. They are both novelists of limitless imagination, who can transport you to any time and place of their choosing. You are in for a treat when you read these books. Go and buy them now! I then had great fun chairing Mary Hoffman and Ros Asquith talking about their collaboration, The Great Big Green Book – a guide to saving planet Earth. Their audience were very enthusiastic and came up with lots of ideas, and it’s clear that the next generation are much more switched on about saving the planet than us oldies! It’s a busy day today… I’m in the audience for A L Kennedy, then doing my own science event, and finishing off by taking part in a panel about science books with Mary Hoffman, Ros Asquith and Christiane Dorion. Better go and get ready…..
Are you quite sure I’m not a disposable cat? ?